When I go through the outfits on my blog, I associate individual specific memories and feelings with every single piece. It is the claim of my own, to create a harmony in interaction with the environment. Particularly I like to work with expressive colors. A strong red, a deep shade of green, or a bright orange reflect my desire for fashion and make my heart beat a little higher. Before my journey to Hong Kong I awaked at night with excitement and thought about all the proposals from friends who already had the luck to discover the metropolis. 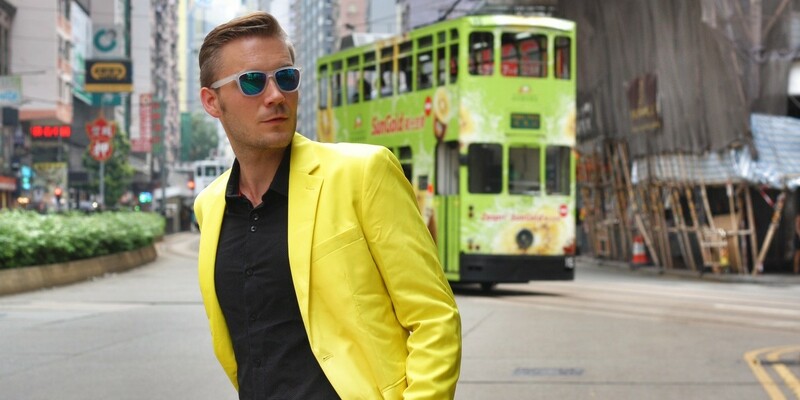 It is the image of a bright yellow suit in the streets of Hong Kong, surrounded by dull sky scrapers, typical Chinese lettering and crowded streets that suddenly comes to my head. I don’t hesitate and look immediately for the perfect suit, a task that will cost me some sleepless nights. My friends think I am crazy when I present them my idea and I hope that one has an idea where I can buy a suitable piece of clothing. Fortunately I found the suit I was looking for online and the long-awaited package came just before departure to Asia. So, the wardrobe for the trip was complete. When I arrived in Hong Kong, the choice of the perfect location was not easy. In the wild turmoil of countless streets, we stroll along Hennessy Road in the heart of Hong Kong Iceland. Here, I have exactly the same feeling as in my inspiration a few weeks earlier, when I saw just this panorama before me. This street offers everything that is so typical for this city. The heat accumulates between the skyscrapers. The facades are not that interesting, but give away the view of many flashing billboards and a colorful tram of another era. The hustle and bustle of traffic and people reflects the soul and the life of this metropolis. Quickly we realize that the locals greatly enjoy my yellow suit. Under the constant click of foreign mobile phone cameras and cameras, we get the pictures in the yellow suit in the shortest time. These are the pictures I dreamed of four weeks ago. That’s my favorite color, and you deserved every click of the camera that you got. Yellow dress is soo cool!